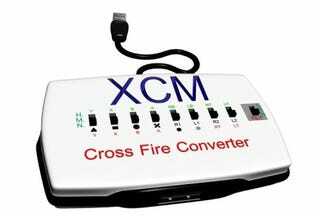 On the opposite end of the fanboy self-loathing scale created by the PS3 XCM Cross Battle adapter is the Cross Fire. It brings Dual Shock controllers to the Xbox 360 (with turbo!). Like its Cross Battle cousin, this adapter delivers the Dual Shock experience some gamers crave but cannot have on their Xbox 360 consoles. It also delivers, via an array of switches, custom turbo settings for every button on the controller. Rumble is also supported, as well as a "tilt" switch, which we imagine is the Dual Shock's motion sensing functionality. So that's in there too, even if there aren't any Xbox 360 games that support such a feature. At the very least, you can't say the folks at XCM didn't cover all their bases with this thing.